The last one is the one I worked on, teamed up with Shane and Andy. 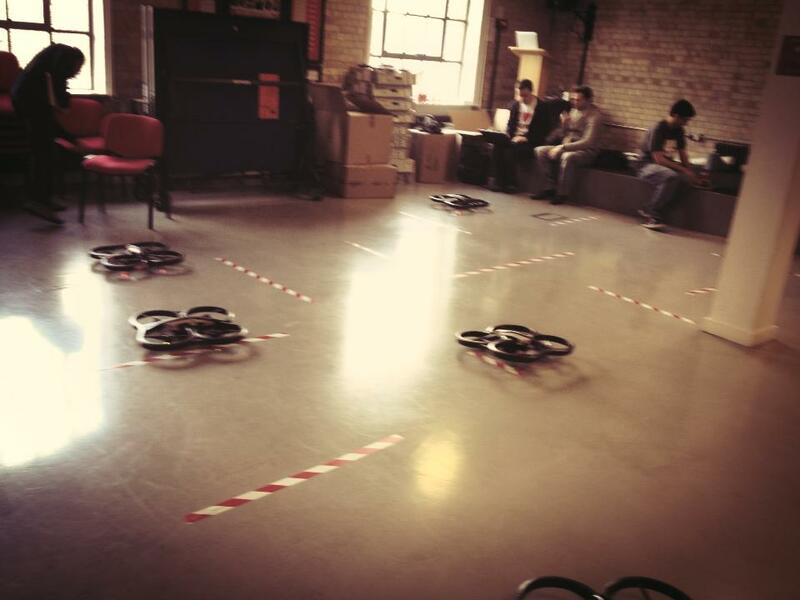 A bit more on how we did it later, but first a quick introduction on Nodecopter. It is a quadcopter controlled with NodeJS. The copter itself is the A.R. Drone 2.0 by Parrot. Features include: WiFi, HD Camera (photo, video recording, real time video feedback), stabilisation system. Amongst the simple commands you can parse to your drone : take off, land, rotate, flip, dance, move forward/back/left/right. 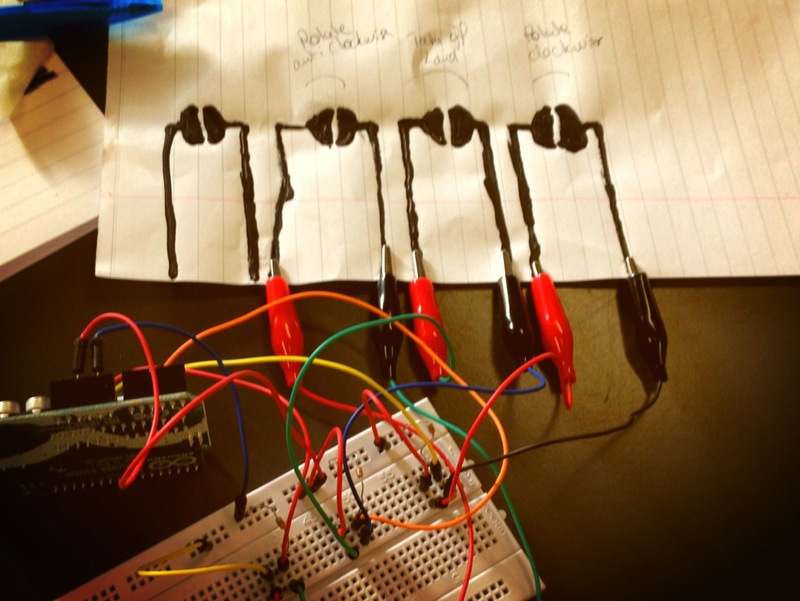 With a bit of conductive paint from Bare Conductive and an Arduino, it is quite easy to turn a drawing into a button. So why not make a dashboard drawn in conductive paint to control our drone? Unfortunately, we didn’t have much time to think about the designs of the buttons, so they remained at ‘wireframe’ stage, but the result was pretty sweet anyway. Here’s a button : connect on leg to your digital pin, the other one to the ground and join the round bits using your finger. When the circuit is closed with you finger, the equivalent of a button press is recorded. Make sure you use at least a 1MOhm resistance. If it’s too low, your press won’t be recorded. I’m not too sure why, I am not an expert in electronics yet, but I will investigate. I found out that I had a problem with my resistance when connecting the two parts with my finger didn’t work, but it was perfectly fine when I used a jumper wire. Anyway, I fixed that quickly and moved on to the next step. Create new functionalities for each button and you can control your drone. Now, if you want to take a closer look at the code, the project is on gitHub. I know it just sounds like we’re a bunch of geeks playing with toys – and it’s exactly what we are, but it is so much fun! I just wanted to say a massive thanks to Andrew, who organised the event, and also to my partners in crime for the day, Shane and Andy.